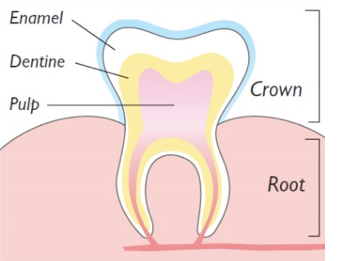 Enamel covers the crown and is the hardest tissue in the body. Dentine constitutes the major part of the tooth and gives teeth their colour. Pulp is rich in nerves and blood vessels. Dental caries or tooth decay is caused by loss of minerals like calcium and phosphate from the tooth surface. This is called demineralisation. Demineralisation is as a result of acids produced by the bacteria on tooth surfaces attacking enamel. Cavities are caused by prolonged demineralisation. 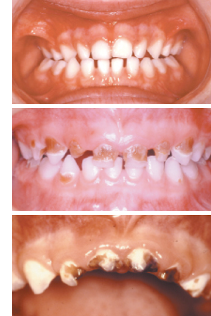 An early sign of demineralisation may appear as a white spot on the tooth. At this early stage, lost minerals can be replaced with the help of fluoride. If minerals continue to be lost, a hole (cavity) forms in the tooth and a filling is needed to repair the damage. Tooth decay occurs on the chewing surfaces, the surfaces between the teeth and around fillings. When gums recede decay can also occur on the root surfaces of teeth. What can you do to prevent caries? Remove plaque thoroughly from all tooth surfaces by daily toothbrushing and flossing or interdental brushing. You may check the effectiveness of your toothbrushing by using disclosing tablets (dyes) which show up remaining plaque. Use a toothpaste with appropriate level of fluoride, twice daily, last thing at night and on one other occasion. Use a soft or medium toothbrush. Brush in a set pattern so that you don't miss any teeth. Use floss or interdental brushes to clean between the teeth, where cavities often develop (ask your dental professional to show you how). Check your diet to reduce sugar intake - especially between meals. If you suffer from a dry mouth, possibly due to medication, talk to your dental professional.